Model 325C L C-Series excavator has six-cylinder, turbocharged and air-to-air aftercooled diesel engine that produces 188 net hp, ergonomic cab and interior layout for easier operation, and work tool connections. Work tools include Pin Grabber Plus and Dedicated Quick Coupler, which enable operator to quickly change work tools in field. Hammer and thumb hydraulic circuits and tool control system enable easy use of a wide variety of specialized tools. Caterpillar announces the 325C L Hydraulic Excavator. The new C-Series excavator offers improved performance through increased horsepower and hydraulic flow, a new cab and interior layout for easier operation, and new work tool options for expanded versatility. Longer service intervals and easier maintenance boost availability and lower operating costs. The new model replaces the 325B L. The 325C L weighs about 63,100 pounds (28 600 kg) and is powered by the Cat(R) 3126B engine. The six-cylinder, turbocharged and air-to-air aftercooled diesel engine produces 188 net horsepower (140 kW), about 12 percent more net power than the 3116TA engine in the 325B L. The 3126B engine features electronic control and the Cat HEUI(TM) fuel system for responsive and fuel-efficient operation. The engine meets Tier II worldwide emissions standards. The 325C L uses the proven open-center, two-pump, negative flow hydraulic system. Increased engine power allows increased hydraulic flow of 10 percent when compared to the previous model. Increased flow works with the hydraulic cross-sensing system to boost productivity through faster implement speeds and quicker, stronger pivot turns. Pump flow decreases when controls are in neutral for reduced fuel consumption and sound. Fine swing control cushions swing start and stop for better implement control. The redesigned cab layout emphasizes simplicity and ease of use to sustain operator efficiency for an entire shift. Fully automatic climate control adjusts temperature and ventilation flow without requiring frequent operator input. Caterpillar now offers an expanded line of work tools to optimize the 325C L for the job. Two different quick coupler options, the Pin Grabber Plus and the Dedicated Quick Coupler, enable the operator to quickly change work tools in the field. Factory-installed hammer and thumb hydraulic circuits as well as a Tool Control System are available and enable easy use of a wide variety of specialized tools. 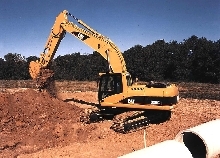 A range of different buckets also expands excavator versatility. More powerful and efficient engine and hydraulics The Cat 3126B ATAAC engine with its HEUI fuel system is built for power, reliability, economy and low emissions. The six-cylinder engine displaces 440 cubic inches (7.2 liters) and features an electronic control module that enables the engine to respond quickly and to maintain efficiency when operating conditions change. The engine has automatic speed control. The two-stage control reduces engine speed when power demand is low for improved fuel efficiency and reduced sound. The engine design and control system improve operator comfort by reducing noise and vibration. The powerful hydraulic system is designed for precise control. The system responds quickly and predictably to operator inputs. For simpler operation, work mode and power mode switches have been eliminated. Instead, the automatic boom and swing priority function selects the best mode based on joystick movement. The new excavator also features a boom and stick regeneration circuit to reduce cycle times and to save energy during boom-down and stick-in operation. Redesigned operator station enhances operation The 325C L is designed for straightforward, comfortable operation. The cab is quiet and features ergonomic control placement and convenient adjustments that allow the operator to fit the machine comfortably. Low lever and pedal effort, ergonomic seat design, and highly efficient ventilation help reduce operator fatigue and improve operator efficiency throughout the shift. The consoles have adjustable armrests for comfortable operation of the ergonomically designed joystick controls. The right hand wall and console allow easy access to all switches dials and controls. The new compact monitor enhances viewing from the operator seat and displays a variety of easy to read and understand information about machine functions. With the optional Tool Control System, five different tool settings can be programmed into the monitor, and the appropriate program can be selected when the operator changes work tools. The system eliminates the need to calibrate the hydraulic system each time a work tool is changed. The window glass is affixed directly to the cab, which eliminates window frames and increases the operator viewing area. A larger right-side window also improves viewing area, and the upper front windshield as well as the upper cab door window open for ventilation and communication with people outside. A large polycarbonate skylight allows natural light to enter the cab, and it opens for ventilation. The skylight also provides a view upward. Versatility from new work tool options The 325C L is designed to be highly versatile. Factory installed hammer and thumb circuits are available as attachments, and the optional Tool Control System maximizes productivity in jobs requiring the use of different hydraulically powered tools. Caterpillar offers a wide range of proven work tools designed to work optimally with the 325C L. Such tools include hammers, shears, thumbs, rotators, grapples and crushers. Caterpillar also makes five types of buckets-general purpose, ditch cleaning, heavy-duty rock, heavy duty and power-for the 325C L. Also, Caterpillar offers two different quick couplers to speed work tool changes. The Pin Grabber Plus and the Dedicated Hydraulic Quick Coupler both enhance excavator versatility by allowing the operator to change work tools without leaving the cab. A variety of front-end configurations offer more ways to optimize the 325C L for the job. Both a reach boom and a mass excavation boom are available. Two different lengths of sticks are offered with each boom. Extended service intervals, easy access The 325C L has extended service and maintenance intervals to reduce machine service time and increase availability. Many daily maintenance areas are accessible from ground level. The 325C L upper structure layout has been changed largely to improve heat exchange efficiency. The radiator and aftercooler remain in the radiator compartment, but the oil cooler and air conditioner are on the cab rear side. The 325C L uses a new track link. The track link is protected with grease lubricated seals, which deliver as much as 25 percent longer internal wear life by helping to keep dirt and debris from entering the pin and bushing joint. Basic Specifications for 325C L Hydraulic Excavator Operating weight 63,100 lb (28 600 kg)* Engine height Cat 3126B ATAAC with HEUI Fuel System Net power 188 hp (140 kW) Range of bucket capacities 0.88 to 2.50 cu yd (0.70 to 1.90 cu m) Transport width 11ft 1 in. (3390 mm)* Track length 15 ft 3 in. (4640 mm) Track gauge 8 ft 6 in. (2590 mm) Max. drawbar pull 54,853 lb (244 kN) Swing torque 60,628 lb ft (82 200 N.m) Max. digging depth 23 ft 3 in. (7.09 m)* Max. reach at ground level 34 ft 6 in. (10.51 m)* Max. loading 23 ft4 in. (7.11 m)* *With 20 ft 2 in. (6.15 m) boom, 10 ft 6 in. (3.2 m) stick and 32 in. (800 mm) shoes, 1.57 cu yd (1.2 cu m) bucket.